Hi friends! SO I get asked almost hourly about what I am eating, what kind of supplements I take, WHY I take them and how I feel about certain brands etc... My camera was stolen and I have so many ideas and videos I wanted to film but I said you know what...lets get back to the basics. 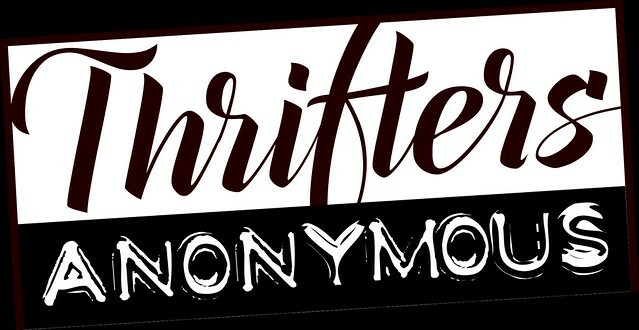 So I am taking my thoughts to the blog and hope that this little series will help. I AM NOT a doctor, nutritionist, EXPERT, GURU, PRO...haha I AM ME...a women who want to live a healthy, happy life...I am always learning and always questioning everything. My opinions change and as I continue to learn my body and listen to what it needs I do feel as though I can help others to do the same! SO with that being said here is the beginning of a series on Supplements...what I have tried, what I use daily, my thoughts, my recommendations and anything in between. I am hoping to have some guest posts from fellow nutritionists and GURUS if you will haha until then let's start with the first question I received! HOW do you use LEVEL 1 Protein from 1stPhorm & Why do you like it? Before I go into a brief answer....Protein ALERT! haha LEVEL 1 ICE CREAM SANDWICH is back in stock!! So delicious! Add some frozen blueberries..UGH..DONE...So good! This is by far one of the best proteins out there FOR ME. Keep that in mind since proteins can be very similar but here are a few facts about Level 1 and a few reasons why I LIKE it better than others! When I speak to other women the first thing I ask is what do you eat in a day? The NUMBER 1 thing that I notice is that they are not eating enough protein in their diet among other things but I am going to make these posts short and quick! After 3 years of training and completely transforming my body I have learned the NEED for protein...The easiest and most effective way to get protein in during the day if you are not physically eating real food is through protein like LEVEL-1. If you were to look at the bottles and compared proteins you are not going to find a huge difference just by glancing at the nutritional facts. After some research and educating myself on how this particular protein is made compared to others I learned the difference. 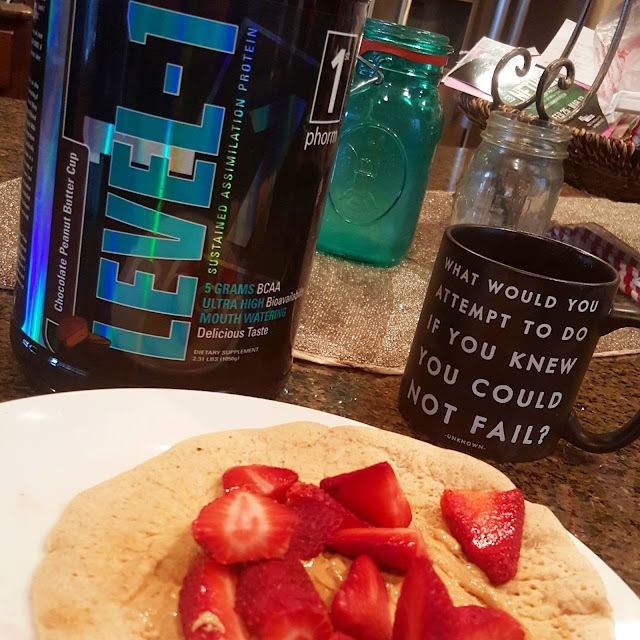 Level-1 is a blended isolate based protein (not all are) however it is not hydrolyzed and it also has some secondary backup protein to help feed your muscles over a longer period of time and really keeps you fuller over a longer period of time. Ideally it takes about 2 hours to digest this type of protein and you will see very low carbs unlike some of the other proteins on the market. Something I like to be aware of when I am trying to dial it in. THE biggest question is HOW TO USE THIS protein. I was so overwhelmed when I started adding protein in my diet. Honestly, I just didn't get it. I saw everyone drinking it after they worked out so I just started doing the same. Not even realizing that the BLEND of protein dictates the time in which you use and take that protein!! I use this as a meal replacement type shake. Usually for my MEAL 2 and/or Meal 4. You guys see me make my protein pancakes with it. One of my favorite meals of the day! Another BIG difference in this protein to others is how it blends and mixes! I can not express to you how important this is. SURE...most proteins are sold as THE BEST TASTING PROTEIN IN THE WORLD! haha ok but sadly everyone has a different sense of taste...so that really shouldn't drive you to buy protein..but it does...cuz who wants to drink or eat a chalky PROTEINY panacake of mush? I have tried several but NONE BAKE like the Level-1 and I LOVE PROTEIN pancakes, waffles, muffins... It also mixes so smoothly so if you are on the run and just add water you won't be holding your nose to down this shake! SO LADIES....Instead of choosing not to eat (which we often do when we are restricting) DRINK a protein shake... 1st Phorm Level 1 will help to BUILD more muscle, LOSE more fat....I know it seems simple but if there is anything I have learned, understanding how to SUPPLEMENT your diet and workouts effectively will ultimately get you to where you want to go! But let me be honest here... ANY supplement I have ever talked about tried or used is NOT responsible for the body I want... I AM...HARD work, consistency... 1 month of being 100% IS NOT going to give you the body you dream of. ALL of us have are dealing with different challenges whether it be health wise or just LIFE...BUT be honest with yourself..TRULY honest...and BEGIN to change your life...and KEEP GOING at if for years... this BACK you see above has taken me 3 years to build and I don't even look like those INSTAGRAM girls...you know who I am talking about... SO remember THESE are just supplements to all that you are doing...if you aren't doing anything neither will they. WAKE UP...NEVERSETTLE and make sure you really take a look at what you are doing...You don't need a fancy gym..a trainer...or even a supplement...YOU just need to wake up and make better choices...go tot he gym...and WORK! 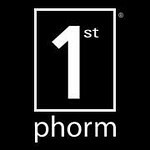 I am working on a few blog posts on more...NEXT will be PHORMULA-1 or your POST workout Protein! PLEASE ask me any questions below so I can address them in my next post! I love your Youtube channel. I tell my husband that you and Edwina are my best friends. Of course, he just rolls his eyes. Agreed instead of starving choose something that is healthy to intake. Knowing the requirement of protein will help to intake in appropriate quantity. Really nice article. Eating enough protein is necessary to build and maintain healthy muscle mass, while also supporting tendon, ligaments and other body tissue. When your diet is lacking in amino acids, muscle wasting can take place when your muscle fibers are broken down to support your body's energy needs.I am using HGH supplements for muscle building and to make to energetic while workout..
What I do is take a creatine/juice/protein drink about a half hour before a workout and than another shake right after. This "bracketing" technique helps set up an anabolic (muscle-building) state for your muscles and helps prevent muscle breakdown from a workout (catabolism). Sports nutrition supplements is a key to success for bodybuilding. With a healthy diet you can make body you dream about. Our sport nutrition shop https://www.biceps-shop.com/ has everything what you need. With us you can be : Stronger, Faster, Harder, More beautiful, HAPPY. "Level-1 is a blended isolate based protein (not all are) however it is not hydrolyzed and it also has some secondary backup protein to help feed your muscles over a longer period of time and really keeps you fuller over a longer period of time. Ideally it takes about 2 hours to digest this type of protein and you will see very low carbs unlike some of the other proteins on the market. Something I like to be aware of when I am trying to dial it in. " I agree with these words but without https://www.biceps-shop.com/the-best-fat-burner-suppl.. you cannot make a beautiful body. So nice article, You have written it just beautifully, I am totally agree with you, With exercise we need healthy nutrients and food to maintain and keep fit our body. To buy the best quality of xcel sports nutrition visit on Nutriverse.